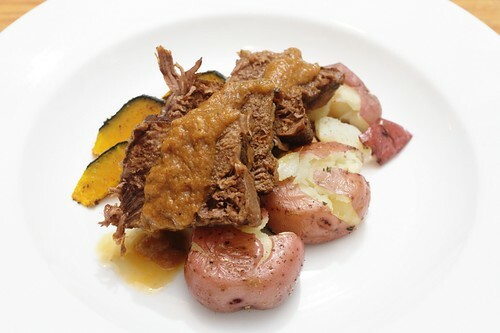 cider and plum braised chuck roast with smashed red potatoes and roasted squash, originally uploaded by aarn! +19th October, 2010+. seasoned, tied-up and seared-off a 2.5-lb well-marbled chuck roast in a hot dutch oven containing 2T. of olive oil. browned both sides and removed the roast from the dutch oven. rendered the fat out of four slices of bacon, chopped into little lardons, in the hot oil, then added one large diced onion and let cook on medium heat until almost translucent. added to the onions two medium size diced plums, 4 smashed cloves of garlic, 1.5T. fresh chopped thyme, 1.5T. fresh chopped oregano, 3 allspice berries, 1/2t. korean chili flakes, 2 cloves, and 1/2t. of whole ajowan. allowed to simmer until heavily aromatic, then added 1c. of white wine, scraped all of the suk from the bottom of the dutch oven and let reduce until syrupy. returned the roast to the pot and poured in 1c. of apple cider, 1c. of chicken stock, and then jostled everything around and mixed in 2T. of tomato paste. covered the top of the dutch oven tightly with tin foil (thanks, cooks illustrated!) and then the metal lid, and placed the vessel in a 325-degree oven for 2.5-hrs, flipping the roast half way through the cooking time. removed a few cups of the braising liquid about 30-minutes before the roast was done. skimmed the fat off the top, pulsed in the food processor, and then reduced with a little more stock and some fresh sprigs of thyme and oregano and some salt and pepper to taste. pulled the roast, sliced it up and served it over some boiled-smashed-roasted red potatoes and some roasted squash, topped with some of the gritty gravy mixture. I get mighty sick of camp food.